Do you really know how your child would respond in the event of an abduction? Now you can. 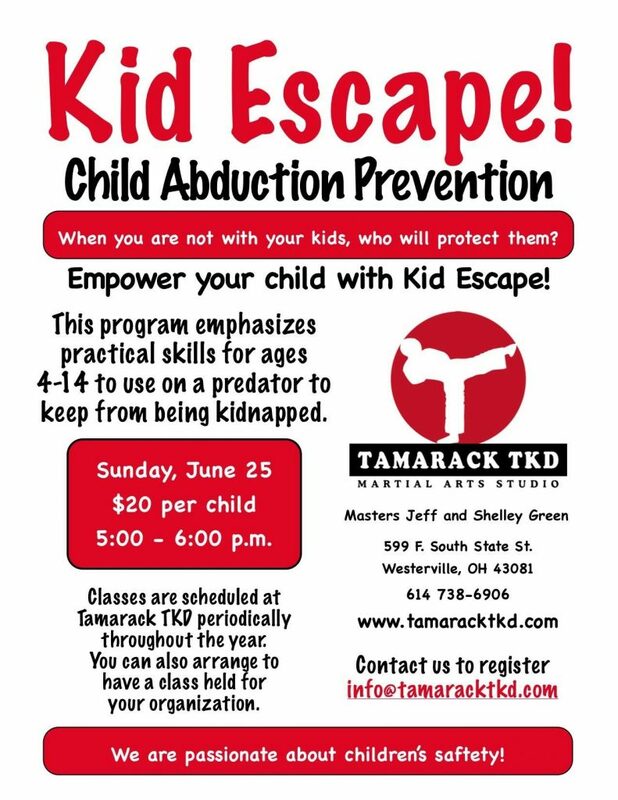 Tamarack TKD offers Kid Escape!, a program that teaches kids how to prevent a kidnapper from taking them to a second location. Kicking, screaming and running are encouraged, but if the attacker is bigger, stronger and faster those techniques may not be effective enough. In a safe, fun atmosphere children ages 4 and up learn practical techniques they can easily use to keep from being kidnapped. Kid Escape! is a nationally recognized program developed by John Hall of Cincinnati, OH. We are Mr. Hall’s central Ohio connection and are trained to teach his program. You can learn more about it at www.kidescape.org. The classes are held at Tamarack TKD Martial Arts Studio, 599F South State Street, Westerville, OH. The cost is $25 for each child. If you are interested send us an e-mail and we will contact you when the next class is scheduled. Also, let us know if your church, school, scout troop or other organization would like to have us come in to teach a class. Click here for the release form. We are passionate about keeping kids safe!